Egyptian Elementals Dance - Cultural Or Commercial? Nomadic Festivities, from the book 'African Ark'. Cultural dance, in its purest sense, would be absorbed organically within the home and community rather than taught. It would reflect the environment and social customs and mores of a people. 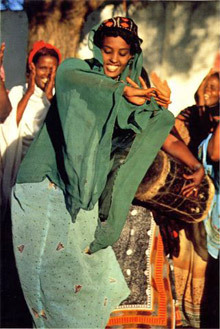 Extant evidence has lead scholars to conclude that many folk dances exhibit links to ancient rites. These pagan connections may have been long forgotten, but the joy and communal bonding engendered via dance has continued through the ages. A cultural dance celebrates heritage, values and customs but most importantly presents an opportunity for communal celebration and individual, joyous expression. Dance in this context is the quintessential affirmation of life. Compare this experience of heritage, values and spirit with the culture that abounds in society today; the quick fix, 'easier is better', approach evident in nearly all pursuits. Belly Dance, which is displayed in an instantly identifiable form throughout the Middle East and Western world, is often described as a cultural dance, but is in fact a clever marketing construct based on the 'show-girl' personae. The historical time line of the ubiquitous Belly Dance flows for less than 100 years. Being a qualified Gym and Fitness instructor I am well aware of the benefits of customized and carefully supervised workouts - however I have also witnessed many fads wax and wane as Gyms vie to attract and retain members. If a ‘new’ skill or trend attracts public attention, i.e. tai chi, pilates, or yoga; it is reformatted to accommodate a larger, diverse and irregular client base, thus it rarely delivers any of its original complexities and most importantly; lasting benefits*. Our relentless quest for personal gratification, a competitive edge – and paradoxically – happiness and spiritual fulfillment drives us on a perpetual search for the 'next big thing' – whilst the ever vigilant marketplace will oblige. To develop the requisite skills of any practiced tradition requires time, commitment and knowledge of culture and history - otherwise where is the lasting and essential value? *Recent research by biomechanists and functional anatomists has revealed some surprising conclusions in reference to the efficacy and safety of training techniques in traditional gyms settings. The Egyptian Elementals Physical Fluidity program addresses these concerns working through the three planes of movement and using full physical integration as training principles. Follow this link for more on Health and Fitness Benefits. Email Juliet to register your interest for class notifications [email protected].